They are also have a high nutritional quality to them – they contain a high amount of antioxidants, including polyphenols, such as tannins and anthocyanins. In fact, pomegranates may have even more antioxidant power than cranberry juice or green tea, according to American Institute for Cancer Research. Only problem with pomegranates? Extracting their seeds can be difficult! The easiest way I’ve found? Cut the fruit in half, soak in water for ~ 5 minutes and the seeds will be easy to break out with your fingers! No more mess. In a small saucepan, bring 3 cups of water and the wheat berries to a boil over high heat. Reduce the heat to low and cover with a lid. Simmer for 50 to 60 minutes until wheat berries are tender. Drain. Preheat the oven to 400 degree F. Line a baking sheet with parchment paper. Trim the eggplant and cut into 1/2 inch cubes. Place the eggplant on the prepared baking sheet. Generously drizzle with olive oil. Sprinkle with red pepper flakes. Toss to coat. Roast for about 30 minutes until tender. In a large serving bowl, whisk together the 2 tablespoons of olive oil, red wine vinegar, and garlic. Season with salt and pepper. Add the wheat berries, parsley, and mint. Toss to coat. 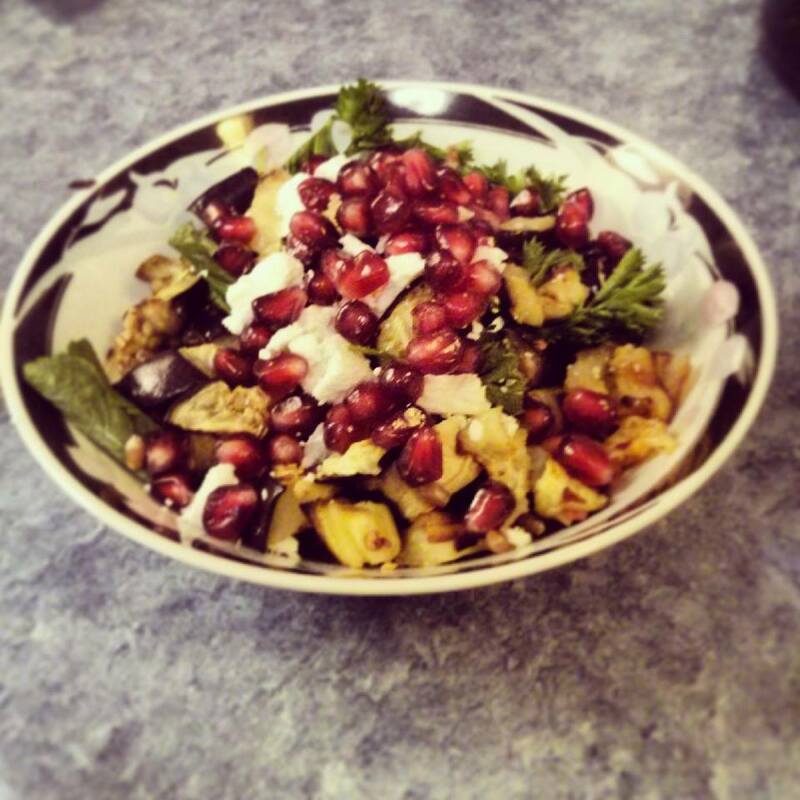 Add the eggplant, feta, and pomegranate seeds. Gently toss to combine. Season with salt and pepper to taste. Serve warm or at room temperature.